Nivenor is a Bosmer citizen who lives in Riften. Wife to the charitable Bolli, she finds his passion for giving silly and pointless. She instead prefers to use their wealth for luxuries. According to a note found in their home, Nivenor is thought to be cheating on her husband with multiple individuals. If you play as a male character, this is further confirmed in her comments directed toward you during encounters where she offers you her company. Nivenor lives a fairly relaxed life, spending much of her time relaxing at home or shopping. She wakes up at 6am and has a one-hour breakfast inside the house. She will then wander around the house for the next four hours, occasionally sitting down, having a quick bite to eat or drink, or using the cooking pot inside the house. She leaves the house at 11am to head to the market plaza in the center of Riften. She will spend the next four hours here, browsing the various stalls in search of new luxuries to purchase. At 3pm, she leaves the plaza and will make her way to the Riften Fishery. She can be found there for the next four hours, sitting in a chair in her office doing paperwork. After a fairly short and perhaps not too difficult work day, she will head back home at 7pm. She will relax inside the house for the remainder of the evening, until she heads to bed at midnight. Nivenor wears a set of fine clothes along with a matching pair of boots. 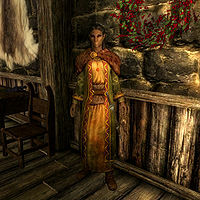 She carries her key to the house, a key to the Riften Fishery, a belted tunic, and a selection of upper-class items and gold. In combat, she relies on a leveled dagger that can be up to elven in quality. Much unlike her husband, Nivenor will quickly make it clear that you will not receive any handouts from her: "If you're looking for a handout, you're not going to get one from me." If Bolli is no longer alive, she will instead say: "Can you believe my former husband used to give most of our gold to the poor?" She will be more than happy to tell you where you can get a handout: "If you're looking for a handout, you'll want to speak with my husband." If you are male, she will also add: "If you're looking for company, I suppose I could do worse." She does not seem to share Bolli's devotion to Mara, as she may tell you: "Bolli's around somewhere, planning to feed the poor with his nonsense about Mara." However, Nivenor will comment on how her husband's devotion to Mara has benefited her: "With my husband's new found religion, what I do with our coin and what I do all day seem less important to him. Suits me." She does seem concerned that Bolli may be becoming too charitable, as she will comment: "At this rate, he'll give the entire Riften Fishery away to charity. Then how will I live?" Perhaps due to her upper-class lifestyle, Nivenor seems to have a fairly naive idea of the difficulties that the poor face, as she may comment: "Such a waste of time preaching to the poor. If they're that hungry, they should just grow some food or something." She may also tell you about how she knows the "meaning of hard work", to defend her belief of not giving people handouts: "I spend every Friday [sic] at the fishery, so I know the meaning of hard work. All those forms to fill out and file; it's exhausting!" As evidenced by some of her earlier dialogue, Nivenor does not seem to be too loyal to her husband and may tell you: "Mark my words. If Bolli thinks he's giving all of our wealth away to some poor slob, I'll leave him high and dry." Upon ending conversation with her, she'll say, "Excuse me." When you attempt to hand her a religious pamphlet, she won't be appreciative at all: "Are you serious? You're as crazy as Maramal." True to her word, she won't give any septims to the poor. She will instead tell Snilf, "Ugh, you smell horrible. Get yourself cleaned up." and suggesting to Edda, "Maybe you should look for work instead of begging for coin." When asked about Nivenor, Bolli will tell you about her: "Nivenor is my wife. How I was ever able to meet such a gorgeous creature is one of life's mysteries." He'll continue by elaborating on his charitable habits: "We're... at odds about my charity. She thinks the people in this town have become lazy and expecting a handout. I try to include her in my lessons from Maramal over at the Temple of Mara, but she prefers to shop instead. Different strokes, eh?" Bolli: "Nivenor, my darling. What a pleasant surprise." Nivenor: "Oh! Bolli... yes, hello." Bolli: "Will we be dining together this evening after my work at the fishery?" Nivenor: "Sigh. Yes, as usual. I'll be there." Bolli: "Decided to show up for work today, eh?" Nivenor: "And just what's that supposed to mean?" Bolli: "It means I have a business to run, I need to have the books straight and you're barely ever here!" Nivenor: "For goodness sake, Bolli! You barely lift a finger yourself when you're here except to point at things for your workers to do. Let them do the work, that's what you pay them for!" Nivenor: "Bolli, I was looking at the finances and I noticed you've been donating gold to the Temple of Mara. Are you out of your mind?" Bolli: "Maramal's been helping me through a rough patch. I just wanted to pay him back. It's not like he's keeping it!" Nivenor: "Uh huh. I'm sure he runs outside with the coin and throws it up in the air so Mara herself can catch it. Come off of it, Bolli." Bolli: "You may be my wife, but this is my business, so just do your job. Don't worry, you'll still have plenty of gold left over to waste on trinkets." Madesi: "Ah, Nivenor. What can I sell you on this fine day?" Nivenor: "I'm looking for a necklace. Do you have anything with garnets?" Madesi: "I have a single one left, quite expensive, but also quite elegant." Nivenor: "Posh. I'm not paying for it. Put it on Bolli's account if you please." Marise Aravel: "Well, if the shoe fits..."
Nivenor: "What's this nonsense I've been hearing? How dare you call Bolli a deadbeat!" Grelka: "If he paid what he owes, I wouldn't have to say anything. Besides, what in Oblivion do you care?" Nivenor: "What's that supposed to mean?" Grelka: "Oh come off it, Niv. We both know you married that fisherman for his gold. You don't need to put on an act for my benefit." Drifa: "So how are things with you and Bolli?" Nivenor: "How do you think? He's a pig. All I am to him is a warm body to lay with." Drifa: "Nivenor! How can you say that? He gives you everything you ask for." Nivenor: "If I cared for your opinion on our affairs, I'd ask. Now, if you'll excuse me." Esta página foi modificada pela última vez à(s) 04h17min de 20 de dezembro de 2014.